I was excited to learn how to use the vinyl cutter. I found it quite simply to set-up, especially with the help of the fab modubles. It was also more relaxing to work on than the laser cutter as there are less safety concerns. The vinyl cutter at the Harvard shop is attach to a desktop from which you pull up the fab modules, input a desired image from a desktop folder, set the output to the Roland vinyl, select cut vinyl as the process, and enter the vinyl print commands found on the desktop. Before you send to print it is important to make sure the vinyl roll is queued up the right spot and that you've set the origin for where you want the knife to cut in. You should also make sure the clamps are down in the back of the machine. Finally, hit calculate on the fab module to see the path and begin printing. 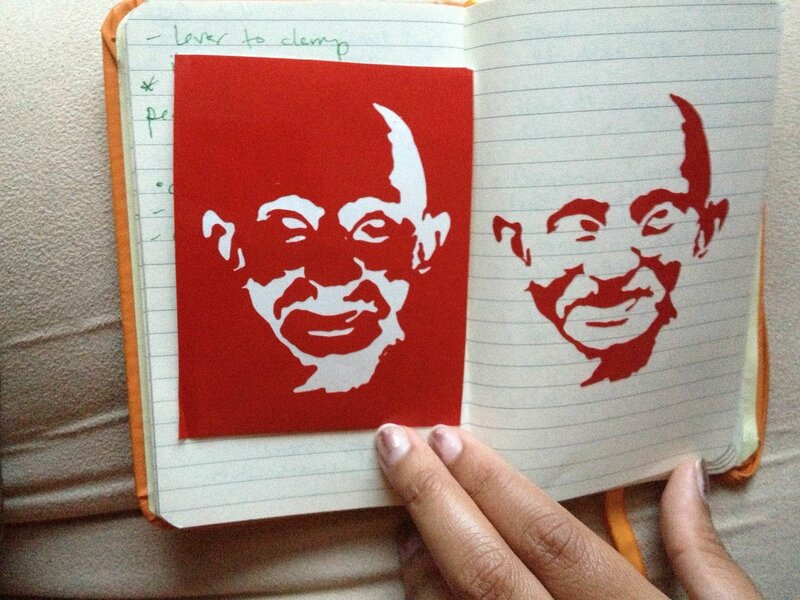 I set the force to 80 for my Gandhi sticker. Next time I will also play around with different pen forces on th machine - I had it set to 0. After it printed I took some of the curved tweezers to remove all of the little pieces of the image and transfered them into my notebook. The picture to the right shows the negative space and the vinyl sticker.